Have you ever had a sticky problem that you just couldn’t solve on your own? You thought about it for hours, and the solution just didn’t present itself. Then, after a few minutes discussing it with a friend or with a colleague, it all came together – all you needed was a fresh perspective. This is the power of collaboration. Collaboration and discussion has been demonstrated to be an effective way of problem-solving and learning, and as a way of fostering new subjectivities and constructing knowledge in groups. Stacey (1999) notes that “the process of communicating electronically enabled the learners actively to construct their own perspectives, which they could communicate to the small group”. It also helps to keep students motivated through encouragement from peers. As social creatures, it stands to reason that we learn and engage better through interaction with others. With this in mind, it isn’t a difficult leap to imagine that discussion forums, as have become widely used in online learning, could also function as a way of scaffolding learners before they begin to explore course content. In educational parlance, this is called a “pre-test”. A pre-test is quite simply a short test given to students before they begin to engage with course content, used mainly as a way of gauging their existing knowledge and then, in conjunction with a post-test or assessment, gauging the success of the course content in passing on new knowledge. Studies have shown, however, that pre-testing has another less-obvious function, in that it allows students to fail so that they may self-identify gaps in their knowledge and be better prepared to fill those gaps as they engage with the course content. By presenting a group of students with a case or scenario, and asking them to solve it, they are forced to seek information and solutions on their own. They may surprise themselves with what they know, but it’s also likely that they will identify gaps in their own knowledge, or realise that certain preconceptions they have are wrong or misplaced. This kind of realisation creates a firm foundation on which to approach new theoretical knowledge, as the student is now fully aware of their need for new learning, and is able to self-direct for the right results by focusing on their own knowledge gaps. This kind of learning is proven to be highly successful and leads to improved understanding of the subject matter as well as greater motivation and a sense of achievement upon success. Traditionally, pre-tests are conducted in the form of multiple-choice quizzes, but this kind of pre-testing fails to produce the kind of critical thinking and practical application required to scaffold learners for mastery. As mentioned previously, and in various studies, small group discussions have the benefit of creating interactivity, fostering critical thought and engagement through writing and allowing for the objectivity of peers to influence a single student’s understanding of a knowledge area. This collaborative element further bolsters the pre-existing benefits of long-form answers, resulting in improved critical thinking, increased motivation, and quite simply, making the learning experience more fun and social for students. Because of these added benefits, small group discussions can function as a better way of pre-testing and preparing students for the information they are due to receive. Students are forced to critically engage with real-life problems before being handed the theoretical knowledge they can use to help them solve those problems. In a sense, they are “warming up” their minds in order to be better prepared to receive knowledge and apply it. In a learning context where transferable, practical skills are key, this kind of pre-testing can go a long way in aiding students in truly engaging with their work at a critical and problem-solving level. At GetSmarter, this approach has been tested on our Graduate School of Business course in Values-based Leadership, and it was found that creating a space for students to engage with real-life problems before encountering the theories that would help them solve these problems increased their interest in the actual course content. 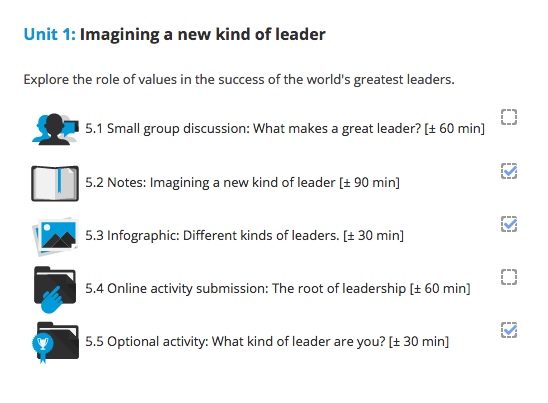 GetSmarter Online Campus for the GSB Fundamentals of Values-based Leadership short course. Because students could see how the work actually applied to their daily working lives, they were more inclined to study it carefully and apply it more readily to their work. This is especially applicable to more “soft skills” subjects, like values-based leadership, but could also be readily adapted to more rigorous subjects, simply by adapting the cases presented to students as part of the pre-test. This method of pre-testing also provided the tutors with upfront information on which students may require additional remediation, which resulted in a more engaged learning experience as the tutors adapted to individual students. A consistent challenge in online learning is making sure that students remain engaged with course content and motivated to self-direct to meet required learning outcomes. Furthermore, the course designer’s number one goal is creating the best learning experience for students while ensuring that they master the subject matter. Small group discussion forums are a proven asset to online learning, when properly administered. Taking the known benefits a step further, these forums can also be used to pre-empt and prepare students for new knowledge by allowing them to engage with real-life scenarios before encountering theoretical solutions. They are made to think critically and engage socially around a problem, preparing themselves for the work ahead. Whether they succeed in finding a solution to their problem or not, the small group discussion should set them in good stead for the learnings in the course content. Dooly, M. 2008. Chapter 1: Constructing knowledge together. In Telecollaborative Language Learning: A guidebook to moderating intercultural collaboration online. Available: https://books.google.co.za/books?id=gbSTsLlsYysC&redir_esc=y [2016, May 23]. The Great Schools Partnership. 2015. Scaffolding. Available: http://edglossary.org/scaffolding/ [2016, May 23]. GetSmarter. 2016. The fundamentals of values-based leadership online short course. Available: http://www.getsmarter.co.za/courses/uct-gsb-values-based-leadership-online-short-course [2016, May 23]. MindEdge, Inc. 2014. The value of pretesting. Available: http://learningworkshop.mindedge.com/2014/11/30/the-value-of-pretesting/ [2016, May 23]. Stacey, E. 1999. Collaborative learning in an online environment. Available: http://web.mit.edu/acs/faq/Online-collaboration/collab-learning_files/stacey.htm [2016, May 23]. University College London. 2015. Teaching and learning with discussion forums. Available: https://www.ucl.ac.uk/teaching-learning/case-studies-news/e-learning/discussion-forums [2016, May 23]. Weimer, M. 2011. Helping students develop problem-solving skills via online discussions. Available: http://www.facultyfocus.com/articles/effective-teaching-strategies/helping-students-develop-problem-solving-skills-via-online-discussions/ [2016, May 23]. Quinn, C. 2008. The case against pre-testing for online courses. Available: http://elearnmag.acm.org/featured.cfm?aid=2139006 [2016, May 23].